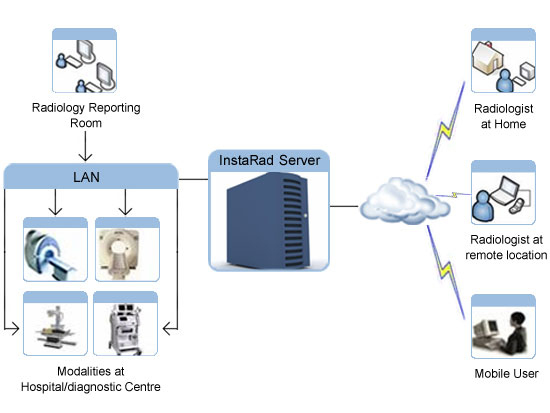 InstaRad is a customizable and scalable radiology imaging solution designed for single hospitals and diagnostic centers. Within seconds, radiologists and referring physicians access high quality, diagnostically useful, compressed and decompressed radiographic images such as X-rays, CTs, MRIs, ultrasounds and other modalities from any place, at any time, and over internet connections of any bandwidth. The specialist analyzes the radiographic image and sends back the diagnosis/report within minutes. InstaRad improves the quality of patient care offered by hospitals and medical or diagnostic centers while saving time and money. InstaRad is a great time saver for patients, doctors, specialists, and hospital staff. Referring specialists view images from home or on the move. The image downloads quickly as streaming technology is progressive and prioritizes the streaming of clinically important data (images on demand). Irrespective of the bandwidth of the internet connection, the viewer displays the refined image almost immediately. As radiologists access radiographic images remotely and send back the diagnosis within minutes, patients get the right treatment immediately. No waiting for a specialist to arrive at the hospital. The viewer includes readymade report templates and patient history for quick reporting. InstaRad’s interface is intuitively obvious i.e. easy to use and understand without the need for long training periods. InstaRad is installed on the server remotely in minimal time. Web based trainings ensure you start using the teleradiology solution immediately. InstaRad comes at a competitive price. Hospitals save on patient transportation costs, film costs, and storage space needed for films. As specialists can access the images from home, office or on the move, they save on commuting costs. Cost savings are passed on to patients as lower medical charges. InstaRad supports a number of modalities and includes multi-monitor support. Apart from the server meeting certain minimal specifications, Customers don’t have to purchase expensive hardware or operating systems to use InstaRad. InstaRad works well on most servers — Dell™, HP®, IBM®, Sun Microsystems®, etc. InstaRad is compatible with Windows®. The Linux™ and Mac version release is under progress. InstaRad accepts DICOM images. Non-DICOM images are converted via a DICOM converter. InstaRad complies with the highest patient information security standards of HIPAA. It is HL7 compliant and US FDA approved. Access control makes sure physicians can only access cases referred to them. InstaRad stores information of up to 6000 cases. It can be upgraded to an image-archival system for long term storage. InstaRad enables remote monitoring of the server and administration.